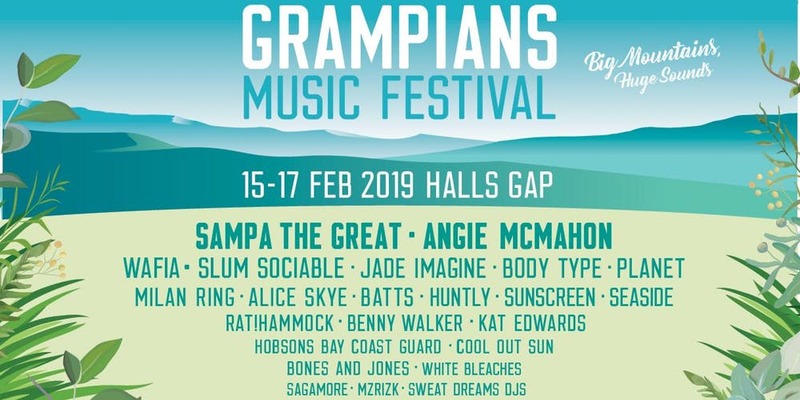 Grampians Music Festival (GMF) is thrilled to lift the veil on its anticipated 2019 line up, with tickets on sale now. The third annual event will take place in the stunning surrounds of Victoria’s Grampians Mountain Ranges from Friday 15 – Sunday 17 February boasting a weekend of some of the best home-grown talent in a truly awe inspiring visual oasis. Leading the charge on the 2019 bill will be the inimitable Sampa The Great and globetrotting singer songwriter Angie McMahon. Other big names on the third festival instalment include Melbourne synth and soul-laden duo Slum Sociable and international charting electronic RnB artist Wafia. Priding itself on creating a safe and inclusive environment that celebrates and fosters a culture of positive change in the Australian music industry Grampians Music Festival is proud to also welcome Alice Skye, Batts, Benny Walker, Body Type, Bones and Jones, Cool Out Sun, Hobsons Bay Coast Guard, Huntly, Jade Imagine, Kat Edwards, Milan Ring, MzRizk, Planet, Rat!Hammock, Sagamore, Seaside, Sweat Dreams DJs and White Bleaches to round out the diverse 2019 festival line up. In partnership with Victorian youth music organisation, The Push, Grampians Music Festival presents an opportunity for emerging electronic producers and DJs from regional score themselves a spot on the line up alongside some of the country’s best new musical talent through the GMF X The Push - Regional Electronic Producer and DJ Competition. The winning Producer will headline a 1-hour set on the opening night of Grampians Music Festival, Friday 15th February 2019 plus a VIP ticket package for themselves and a friend. The winning DJ will have the opportunity to play between sets on Saturday 16th February and kick off the Sunday program on the 17th of February. For more information and tickets head to the Grampians Music Festival website here. Proudly presented by PBS 106.7 FM.